Vinotheque Basic Credenza 3 Door Dbl (P/N 7579). These cabinets are styled with full-length glass doors framed by premium wood veneer. The combination of the tinted glass and wooden door frames provide a uniquely classic view of your wine collection, and a variety of wood and stain options allow you to customize your cabinet so that it will fit perfectly in your home. The new Pedestal Design is a major advancement in cabinetry design which offers numerous benefits. The top and bottom of the cabinet are extended with an enhanced frame to be flush with the doors. A new hinging system sits atop this frame to hold the doors in place without excessive pressure on the base of the cabinet. These hinges include re-enforcement brackets on the doors to prevent cracks and damage. 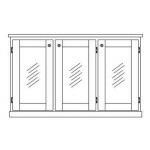 They offer zero clearance door opening for built in applications. This design offers superior longevity in use at restaurants and hotels where wear and tear can be excessive. This pedestal design also offers superior structural integrity for attaching crown and base moldings. With the firm support of the pedestal, the molding is much less likely to incur damage during delivery or from moving the cabinet around in your home or business. 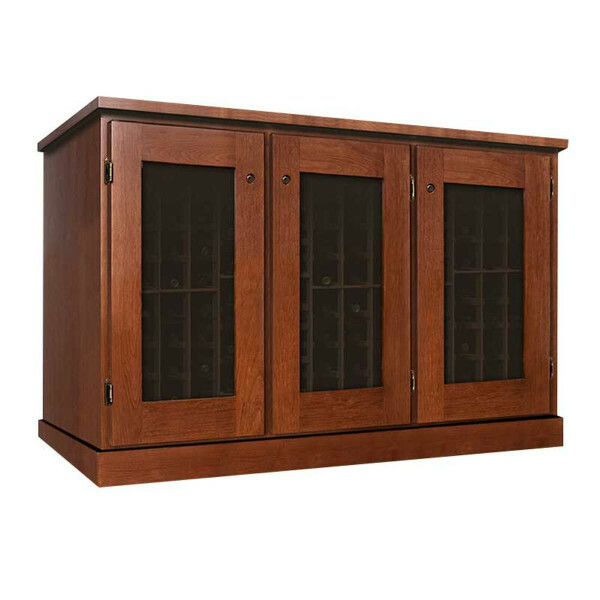 The Basic Window wine cabinets are defined by simple elegance. Inside columns that measure 3.5-inches wide, perfect for Bordeaux, Chardonnay, and tapered bottles. 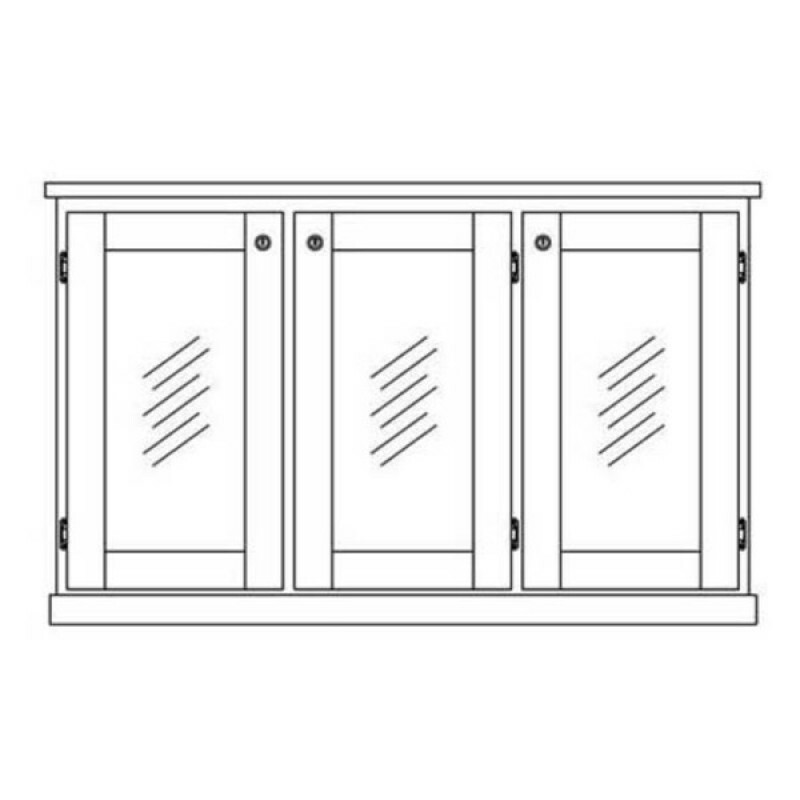 Outside columns measuring 3.75 inches wide, to accommodate larger burgundy, pinot noir and champagne bottles, while still holding smaller Bordeaux bottles. Bulk storage at the bottom of the cabinet for magnum and split bottles, special wine boxes, and/or anything oversized that you want to store in the cabinet. This space measures 8-inches high and spans the width of the wine cabinet. Cherry wood offers a fine grain and smooth texture, with interesting grain variations and color variations ranging from red to yellow and green. Cherry wood accepts stain and finish well. WhisperKOOL's QT system is the most advanced, quietest cooling unit on the market today. We utilize bronze colored cold-plate evaporators to absorb heat from inside the cabinet and discharge it outside the cabinet. The cooling system is designed to maintain optimal temperature and humidity conditions for storing and aging wines. We include a display row with every Estate Series wine cabinet from Vinotheque. Display rows allow you to view your favorite wines without having to handle the bottles. A second and third display row option is available at an additional cost of $169 per row. To order an additional display row, indicate your preference in the special instructions on the final page when you checkout. Door knobs are a new feature with these cabinets. The reasoning for replacing the old style handles with knobs is twofold. Knobs are a simple, clean look. Handles can add or detract from the look and feel of the cabinet. The right style handle is a very personal choice for many of our customers. When standard handles are added at the factory, the customer is limited to the size handles they can add after the fact. By utilizing knobs, only one hole Is drilled, providing maximum flexibility if a change in hardware is desired. Locks are included in the price of these wine cabinets. All Vinotheque wine cellars and WhisperKOOL cooling units are made in Stockton, California.